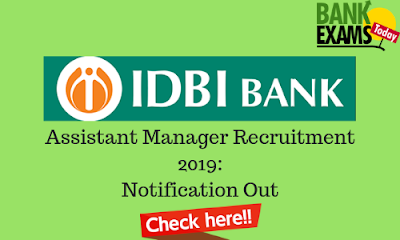 IDBI Bank (51% shares held by Life Insurance Corporation of India) invites Online Applications from eligible Indian citizens for the post of Assistant Manager. Last date for submission of ON-LINE applications:- 15.04.2019. Tentative Date of Online Test:- 17.05.2019. A Graduate from a recognized university with minimum 60% marks (55% for SC/ST/PWD).